60 PTOLEMEE, C. / FRIES. Asiae Tabula Decima Continet Indiam intra Gangem. Vienne, Gaspar Treschel, 1541. Col. Bois grav� colori� post�rieurement. - Woodcut later coloured. 295 x 475 mm. � Carte figurant l'Inde - Map of India. Title from verso, along with Latin text description. Woodcut using blocks cut in 1522. Published in Vienne by Gaspar Treschel. 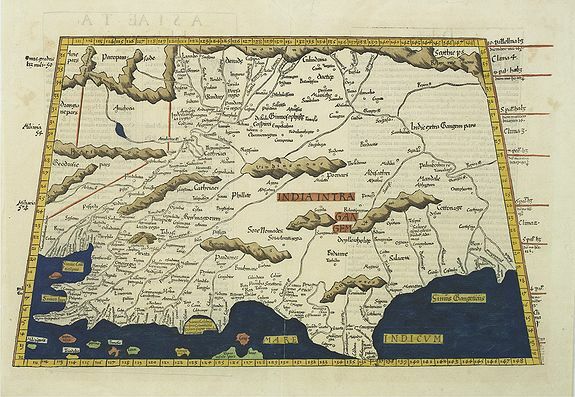 65 MERCATOR, G. / HONDIUS, J. India Orientalis. Amsterdam, 1619. Papier un peu jauni, pli central consolid� en bas sur 10 cm. - Paper slightly age-toned as usual. Split in lower part center fold re-inforced. 354 x 483 mm. � Edition en fran�ais. 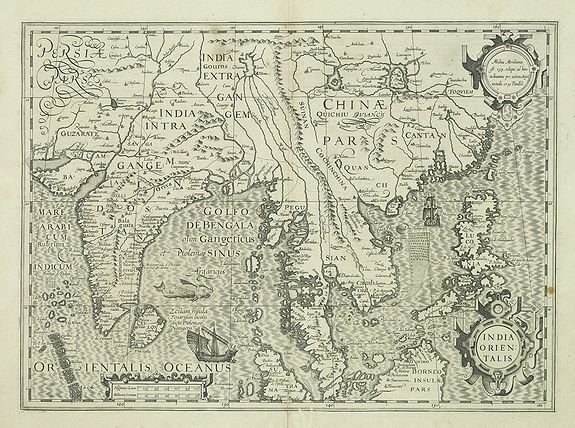 - Published in Hondius' editions of the Mercator Atlas from 1606 onwards, showing the Indian subcontinent, the Malay peninsula, Siam and Cambodia, China and the Philippines, and parts of Sumatra and Borneo. Many of the place names reflect Portuguese activity throughout the region. The decorative detail includes a large sea monster and an oriental junk in the Bay of Bengal. One of the most interesting and unusual features of the Southern Malay peninsula is its dissection in two, the southern part becoming an island just south of Malacca where it is separated from the rest of the peninsula by a large north-easterly channel.